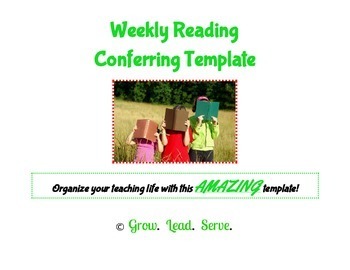 Have you ever felt that it is hard to find the time to organize your weekly reading conferring groups? You have probably changed you mind on how you are doing it over a million times, like myself! Out of everything I have tried, this has been the GOLDEN recipe for success. I teach my reading lessons in "mini-lesson" true form - 15 minutes. The rest of my hour block, I confer, meet with strategy groups, and benchmark students to see where their reading level is and to check for progress. 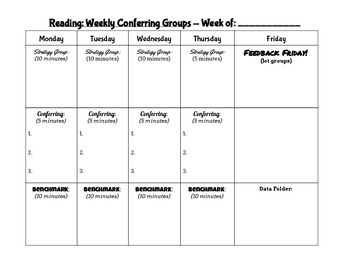 Print this template and update it weekly based on your student groupings and needs! I then keep all of these forms in a binder and refer to them weekly. I teach two classes of 25-30, and I use one sheet for each class. Also, I do "FEEDBACK FRIDAY" where I use jot groups to assess learning. Students jot about their reading, and based on their jots, I work with them in groups to help them clear up or elaborate their thinking! This has been a LIFE SAVER for me, and I know it will be for you, too! It's only A BUCK!